At the press conference this morning were Alexander Garrard MD, Michele Caliva, Cynthia Morrow MD, Christine Stork and Jeanna Marraffa. Synthetic marijuana has killed at least two young men and caused an alarming increase in calls to the Upstate New York Poison Center this year, prompting health officials to ask for help from the community. 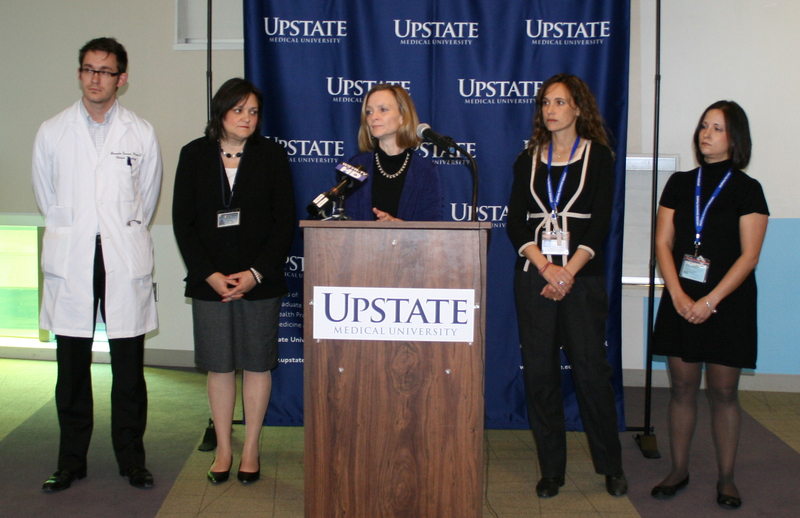 “One of our great concerns is, it’s readily available, and it has the appearance of being safe,” Dr. Cynthia Morrow MD, Onondaga County’s health commissioner, said at a news conference this morning at Upstate Medical University. She called on parents to speak to their children about synthetic marijuana and store owners to “do the right thing” and remove the products from shelves. The products — with names such as “Spice,” “K2,” and “Blaze” — are dried herbs coated with a variety of chemicals to mimic marijuana. They may be packaged as herbal incense, fish food, room deodorizer or pond cleaner and marketed as legal alternatives to marijuana. They’re sold in convenience stores, smoke shops and online. 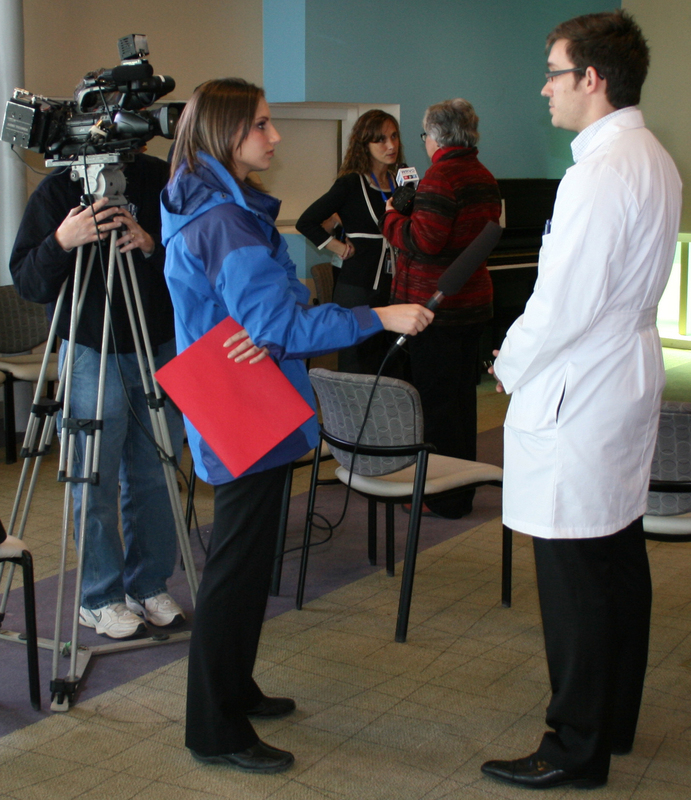 Dr. Alexander Garrard is interviewed during the press conference Monday. “Although package labeling reads ‘not for human consumption,’ this fake marijuana is generally smoked, used as a substitute for marijuana, to get high. The product is cheap, easily accessible — and still legal,” said Dr. Christine Stork, clinical director of the Upstate New York Poison Center. Morrow said the Onondaga County Medical Examiner investigated the deaths of two young men who died after using synthetic marijuana, but she respected the families’ privacy and gave no additional details. The medical examiner routinely investigates deaths in counties outside of Onondaga, and it’s possible other people have died without authorities suspecting synthetic marijuana as a cause. Because people can purchase synthetic marijuana so easily, doctors say they mistakenly believe it’s safe. Real marijuana produces a relaxed state and euphoria; the synthetic kind often has the opposite effect, making people agitated. “We don’t really know everything that’s in these products,” said Dr. Jeanna Marraffa of the Poison Center. Drug makers keep changing the chemicals, to stay ahead of legislative efforts to ban synthetic marijuana. More than half of the patients seeking medical care after using synthetic marijuana are agitated. Their hearts race. Their body temperature and blood pressure rises. They may suffer seizures, muscle breakdown or kidney failure. Not only that, but long after the drug appears out of the person’s system, many people report a change in behavior and/or thought processing that lingers. Upstate’s weekly radio show, Health Link on Air, addresses the subject of synthetic marijuana Sunday, April 1 from 9 to 10 a.m. on WSYR Newsradio 106.9 FM, or AM 570. The Poison Center is launching a campaign to raise awareness and educate the public on the dangers of synthetic marijuana. Officials are targeting parents, teachers, youth, healthcare workers, church groups and other organizations. To invite a speaker from the Poison Center to speak to your group, call administrative director Michele Caliva RN at 315-464-7073. Listen to Part 1 of the Health Link on Air radio interview. Read the warning from the New York State Department of Health. Read about New York’s efforts to ban synthetic marijuana. Schedule a speaker from the Poison Center. This entry was posted in community, HealthLink on Air, poison center/toxicology and tagged academic medical center, health care blog, health care social media, hospital blog, hospital social media, medical blog, parent advice, SUNY, syracuse health care, syracuse hospital, university hospital, upstate medical, upstate university. Bookmark the permalink.